Here's the meme we're all doing for the What's Cookin' apron/recipe swap. It was harder than you might think, since I only came up with maybe 3 of these! 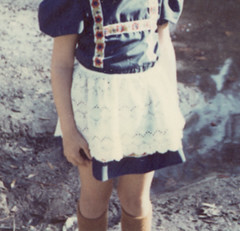 An eyelet apron from Germany, part of a traditional outfit my mom's friend brought back when I was maybe 5. I loved that outfit, and I still have the apron! Somewhere...update: still can't remember where it is, but I found one old polaroid in my photo album that shows me wearing it. At the duckpond, apparently. If it has to be finished, then it's my "White Christmas" apron that I did for the holiday theme Tie One On. Otherwise, it's my still unfinished entry for the Tie One On white/yellow theme from April -- I threw my back out the last week of April and couldn't finish it, and since I blew getting it into the TOO gallery, well, I just haven't finished it. Last year I had some of this fabric laminated on the front to make a waterproof apron; originally I was going to use it to make an apron from this pattern, but now I want to use the pattern Rebecca used here. All that bias tape though...yikes! I'm happy with my current sewing machine and serger -- if I was better with the serger I might want a fancier one. And someday I wouldn't mind a full-on embroidering machine. At the moment my mad money dream is to get one of these Hello Kitty sewing machines to give Emily when she's bigger! Green or blue...who can choose? 5. what do you put in your pockets? or what strange thing have you ever found in them? I don't have pockets in any of my clothes except some of my coats and jackets. I rarely use them, but every year when I get them in the fall I find something odd in at least one pocket. Little toys I can't remember getting, usually. I've lived in the NYC area long enough to say mustard. Soy sauce, also. 7. do you wear more showy aprons or dutiful ones? Could not live without my bread machine and rice cooker. The indoor grill we bought -- it just was too much trouble and mess. I don't cook with recipes that often, but one thing that needs a recipe which I do have memorised is baked macaroni and cheese -- it's the actual recipe from the Automat company. Evan wanted me to try it to see if it was like he remembered and it turned out to be the best macaroni we'd ever had. I can't believe I keep forgetting to post about this! I got an email last week scouting me to appear on that show Wife Swap; apparently they're looking for some families/wives who are collectors of some sort and came across my old guide to female action figures. So they contacted me to see if I'd be interested -- how freaky! I can't imagine actually doing a show like that -- even if I was willing to look like an idiot on tv for money, I don't really like the idea of putting small kids on tv since they can't make that decision for themselves. But still, a fast $20K? Good thing Emily isn't old enough or I might have been tempted! That's a lot of college fund...and I guess that's how people talk themselves into doing things like that. You can guess at the jokes Evan made when I told him about the email. Finally, I got the chance to try my hand at a freezer paper stencil; I'd been wanting to do it for a while since I definitely don't have time to mess with even the simplest screenprinting. This morning I made this swing shirt for Emily, and it came out really swell, we thought! 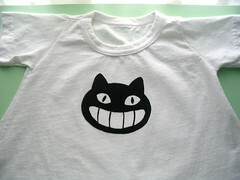 The design is a little cat face from the credit sequence of Totoro. (See it bigger here!) It was pretty easy too -- I pencilled the design on the freezer paper (on the dull side), cut out the stencil with an x-acto, laid the pieces out on the shirt (shiny side down) and ironed them on. Then dabbed on some black fabric paint, peeled up the stencil pieces (the only really scary step), let the paint dry and heat-set it. I'm sure there's loads of tutorials but I basically followed the system I saw here (where I first saw this idea), especially Amy's brilliant step of adding freezer paper behind the stencil as well. I didn't let it dry overnight though -- I used the blow-dryer on it and heat set it so I could put everything back away as fast as possible. We're all excited to make more stencils! 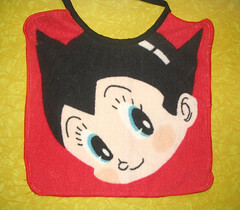 Also this week, a new washcloth bib, made from an Astroboy washcloth someone gave us years ago (I'm thinking it was our friend Devon but I'm not sure). I think Emily loves it way more than we do! Beat yolks of six eggs. Add condensed milk, pour in the molasses and caramel syrup. Thoroughly mix marshmallows with bananas. Add liquid ingredients and set aside to cool. Serve with meringue and sweeten to taste. Obviously, the "sweeten to taste" part is a big joke, haha, about as funny as the short was. (i.e. NOT). I could almost believe this was some noxious 1930s recipe except there is a major step obviously left out...you cool it, but it's never been heated. I did wonder for about 15 minutes if it was possible to make something from this. Then I decided it would just be too gross and sweet no matter what you did! But if you're brave enough to take a crack at it, go right ahead! All Purpose and Kitchen Tested!! I'm excited to finally unveil a project my galpal Mary and I have been working on for literally months -- What's Cookin', an apron & recipe swap. The idea is to swap handmade aprons and some of your favorite recipes with like-minded crafty types. 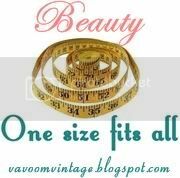 I think it'll be lots of fun, so if the idea sounds at all interesting, come on over and read all about it. And maybe I'll see you in the sign-up list!